Bringstock, salt, and 1 tablespoon butter to a boil in a heavy saucepan, then add grits gradually, stirring constantly with a wooden spoon. Reduce heat and cook at a slight simmer, covered, stirring frequently, untilstock is absorbed and grits are thickened. This should take about 15 minutes. Stir in 1/2 cup stock and simmer, partially covered, stirring occasionally to keep grits from sticking to bottom of pan, 10 minutes. Stir in remaining 1/2 cupstock and simmer, partially covered, stirring occasionally, until liquid is absorbed and grits are thick and tender, about 35 minutes more. Remove from heat, and stir in cheese and pepper. Meanwhile, heat the oil in a heavy large skillet over medium heat. Add the sausages and cook until brown on both sides, about 7 to 9 minutes. Remove from the pan. Keeping the pan over medium heat, onions and cook until golden brown, about 5 minutes. Add the garlic and cook 2 more minutes. Last, add the tomates and stir. Cook for an additional 5 minutes. Add salt and pepper to taste. 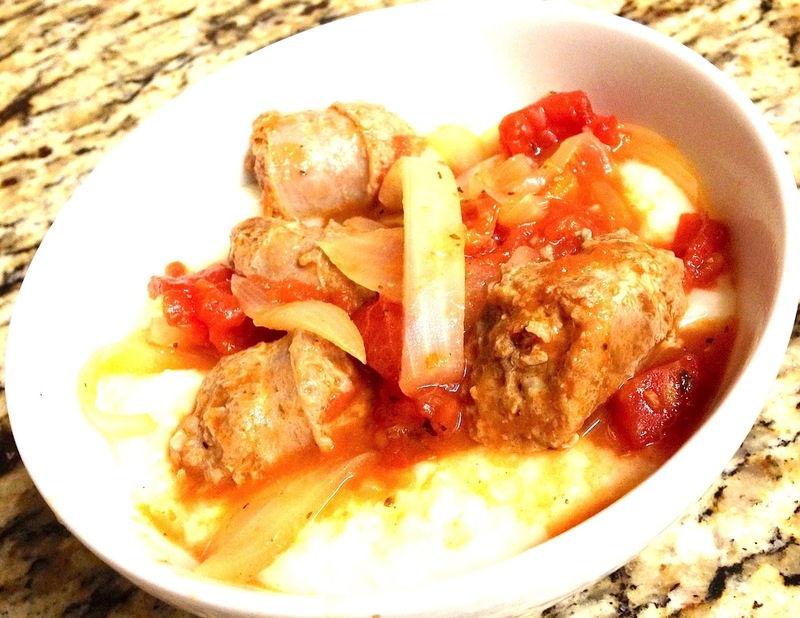 Serve grits in a bowl, topped with the tomato sausage mixture and enjoy!